Camp Concordia was a World War II internment camp for German POWS from May 1, 1943 through November 8, 1945. At its height, the camp held over 4,000 Germans. 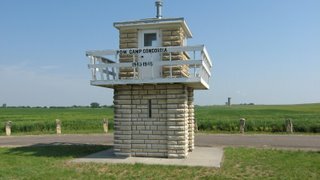 Strategically located in the heartland of America, where prisoners could be employed on local farms, the camp saw only 2 escapes and 8 POW deaths during its operation. Hastily built in the spring of 1943, the camp consisted of more than 300 buildings, including a hospital, post, restaurants, fire department, and barracks. Total cost of building the Camp Concordia was $1,808,806. Read more about the camp history. 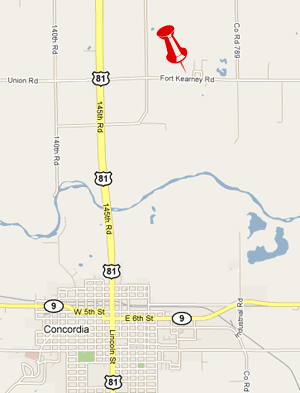 The camp is located 2 miles north and 1 mile east of Concordia, on Union Road. Use the handy Google Maps gadget to get driving directions.